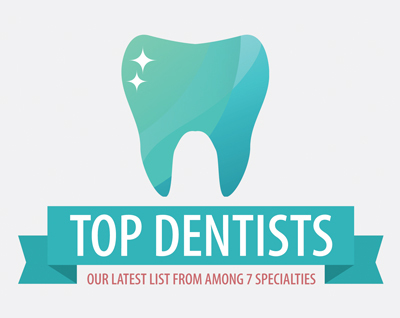 This list is excerpted from the 2017 topDentists™ list, a database which includes listings for more than 190 dentists and specialists in the New Orleans area. The Louisiana list is based on thousands of detailed evaluations of dentists and professionals by their peers. The complete database is available at usatopdentists.com. For more information call 706-364-0853; write P.O. Box 970, Augusta, GA 30903; email info@usatopdentists.com or visit usatopdentists.com. 20204 US Hwy. 190 E.
3108 W. Esplanade Ave., N.
This list is excerpted from the 2017 topDentists™ list, which includes listings for more than 190 dentists and specialists in the New Orleans area. For more information call 706-364-0853; or write P.O. Box 970, Augusta, GA 30903; by email (info@usatopdentists.com) or at www.usatopdentists.com. topDentists has used its best efforts in assembling material for this list but does not warrant that the information contained herein is complete or accurate, and does not assume, and hereby disclaims, any liability to any person for any loss or damage caused by errors or omissions herein whether such errors or omissions result from negligence, accident, or any other cause. Copyright 2010-2017 by Top Dentists, LLC, Augusta, GA. All rights reserved. This list, or parts thereof, must not be reproduced in any form without permission. No commercial use of the information in this list may be made without permission of topDentists. No fees may be charged, directly or indirectly, for the use of the information in this list without permission.